I’ve been finding it difficult to get out and shoot new material for a variety of reasons, but today was such a nice day I decided to make an effort to get out and at least shoot something. 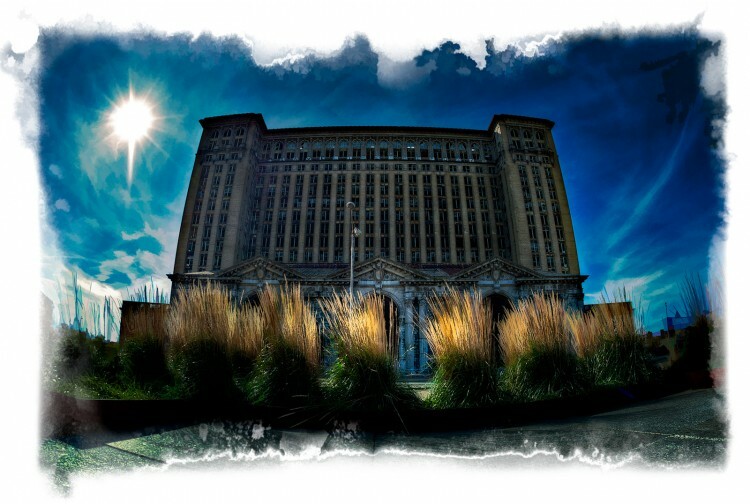 I decided to take a short drive into Detroit to check out the progress on the Michigan Central Station. The owners are finally doing something to at least stabilize the building. Mostly this involves tightening security around the station to keep people out, removing the broken windows and putting in new windows, and working on the roof. Progress is slow, but they have definitely made some progress at least regarding the windows on the lower level. They haven’t actually replaced any that I could see, but they have removed the broken glass. 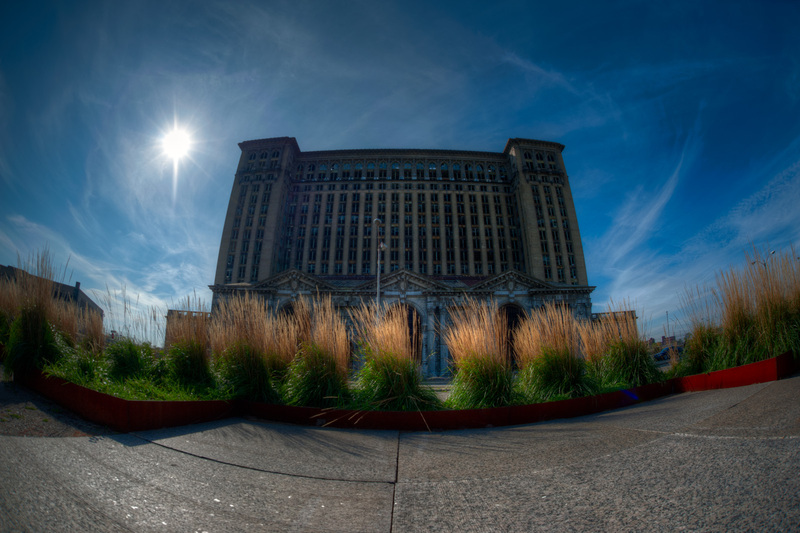 The shot was taken with my 15mm Sigma Fisheye. I’m not sure I really care for the bowed effect in this shot and debated about letting Lightroom do a lens correction, but I decided to keep it as shot. I took a series of 5 shots, hand held, and combined them using Photomatix to create an initial HDR image (seen below). I then took the HDR image into Photoshop and used OnOne Software’sPhotoTools to play with the image. I didn’t have any particular look in mind when I started, I was just trying out some filters, mostly from the HDR collection, to see what effect it had on various parts of the image. If I saw something I liked, I would alter the opacity and brush it in to the places where I thought it looked good, and removed it from places that it didn’t. I then used the PhotoFrame tool to add an ‘Acid Burn’ edge to the image. I finished the image off with Topaz Simplify which I used mostly on the sky and to a lesser extent the rest of the image. Love to hear your comments on this one. This is very cool, I like it! Particularly the way the tufts of grass are glowing in the sun. I’ve always been attracted to the way tall grasses look when backlit by the sun and there is a large planting of these grasses in front of the building (mostly behind where I took this shot). The grasses made a nice foreground (or the building made a nice background). Thanks for the comment! That’s a really cool frame and some nice processing. I like how the sun is placed in this shot. Perfect. I really like it. Great effect. I really like the processing. You’ve created a sense of drama: the bright grass in the foreground, the handling of the sun, and the edge effect all contribute. It all adds to the sense of dereliction and mood.